Media coverage tends to focus on politics and ignore civics. Parkland is the exception. This article uses data and analysis from Media Cloud, an open-source, news analysis platform developed by researchers at the MIT Media Lab and the Berkman Klein Center at Harvard University. The news often focuses on the politics, rather than the civics, of change. When there’s a citizen’s movement, or when an important bill is passed, the greatest emphasis is usually on the statements, actions, and reactions of state officials, political leaders, and political parties. This type of coverage creates less “room” – conceptually, and physically – for referencing contributions of those driving the change from the bottom - the voices and actions of non-state actors like citizens, activists, community organizations, and special interest groups that helped to move the issue onto the political agenda. This politically-focused approach to coverage of civic and social change is not new. However, the strength of this news frame has increased dramatically over the last two years. Since the election of Donald Trump in November 2016, about 20% of all sentences that refer to civic or social change also mention Trump, compared to pre-November 2016 levels where the correlation with Obama was about 2% (Image 1). Image 1: Number of co-mentions in the same sentence of one or more terms of civics/ activism and Trump/ Obama in the U.S. mainstream news between 01/01/2012 and 05/01/2018. Take DACA, a policy that offers protection for individuals brought into the US illegally as children, for example. DACA received vast amounts of media attention (image 2), yet the dialogue surrounding it was primarily political. The words most closely referenced with the term ‘DACA’ were ‘Trump’, ‘democrats’, ‘republicans’, ‘lawmakers’, or the ‘GOP’ (image 3). The most mentioned people do not involve activists or students affected by and involved with DACA, but rather state actors like Trump, Obama, Clinton, Scott Pruitt, George Bush, Bernie Sanders, Rex Tillerson, and even a foreign political leader, Vladimir Putin (image 3). 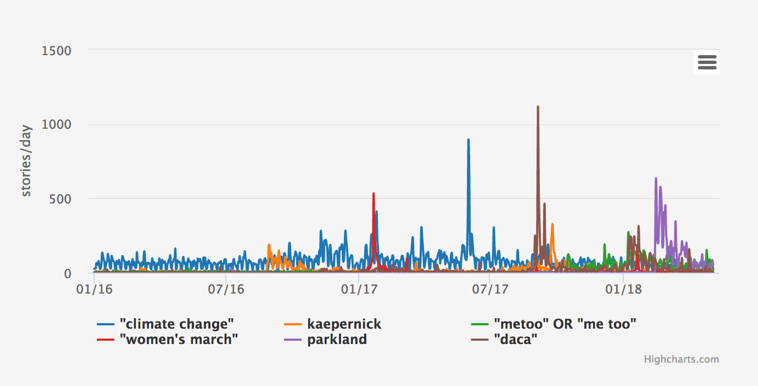 Image 2: Media attention over time (stories per day) of the top 6 issues in the U.S. mainstream news referencing social or civic change between 01/01/2016 and 05/01/2018. Image 3: Word space model that shows the term ‘DACA’ is more closely associated in the U.S. mainstream news between 01/01/2016 and 05/01/2018 with political entities such as Trump, democrats, republicans, lawmakers, or the GOP. Image 4: Top mentions of people detected, using the Stanford’s Named Entity Recognizer, in stories about DACA in the U.S. mainstream news between 01/01/2016 and 05/01/2018. A representative of United We Dream, a major non-profit working on immigration issues in the U.S., said over an interview that when reporting DACA, the media tended to quote policy experts and people of Congress, but missed the point that the people impacted and fighting for their rights often had the greatest expertise. Similarly, media coverage around climate change, which receives the most attention overall among the top 6 topics of change and activism (image 5), is also largely framed as political. Some of the most frequently mentioned terms around ‘climate change’ over the last two years are of political leaders and entities, such as ‘Trump’, ‘Obama’, ‘Pruitt’, ‘Republican’ and ‘EPA’ (image 6). Image 5: Climate change receives the most attention overall (total number of stories published) within reporting of top 6 stories of change and activism in U.S. mainstream news between 01/01/2016 and 05/01/2018. Image 6: Ordered word cloud showing the most frequently used terms with ‘climate change’ in U.S. mainstream news between 01/01/2016 and 05/01/2018. However, the media coverage of Parkland was a departure from the trend that DACA and climate change coverage reflect. The media reporting during and after the shooting at the Marjory Stoneman Douglas high school in Parkland, Florida has seen a strong focus on the civics of change. First, unlike the DACA coverage, those fighting for change have been a central focus of the reporting. While prior to Parkland, coverage of gun violence focused on the statements and information given by political leaders like Trump, Obama, Clinton, and Bush, post Parkland 9 (image 7), 5% of all stories about gun violence mentioned the Marjory Stoneman Douglas student David Hogg (image 8). Image 7: Top mentions of people detected, using the Stanford’s Named Entity Recognizer, pre the Parkland shooting. Image 8: Top mentions of people detected, using the Stanford’s Named Entity Recognizer, post the Parkland shooting. Second, the aftermath of protests and activism has received far more attention than the shooting itself (image 9). This focus on the fight for change rather than just the politics of change has allowed the issue to stay in the news longer than any previous shooting. Much of this has been focused on the March For Our Lives and #NeverAgain movement started by the students of Marjory Stoneman Douglas. Image 9: There have been two significant peaks in the coverage of gun violence in the U.S. mainstream news. There is a sizeable pick up in the mid-February region--which corresponds to the February 14th Parkland Shooting at Marjory Stoneman Douglas High School. Eventually the buzz started to die down, only to be met with an immediate spike again a month later in around the 11th-18th of March, around the time of the first major school walkout. Third, this extended coverage has included an explicit conversation about the civics of change. The student’s movement has prompted the media to actively discuss the role of civic education and the value of activism. The Atlantic wrote about the quality of the AP education at Stoneman Douglas, CNN used the example of the Parkland students to emphasize the importance of civic skills, and the Washington Monthly and Splinter talked about the strong civic education laws in Florida as well as the teacher who taught civic studies teaching at the high school. The Parkland model of reporting change is far more empowering for news audiences than the DACA or climate change models. Not only does it reflect the voices of those affected and advocating reform, but also focuses on methods and solutions of change rather than just the politics. Intentionally focusing on civic actors can help in turn foster social and civic change, as well as address the overwhelming political framing of current news coverage. Further, stories with human characters at the core are far more engaging for readers than the dry machinations of policy or the negotiations of politics. Continuing this model would serve both readers and journalists well. The topic received the highest number of stories per day at its peak point of media coverage than the peak points of the other five top civic and social change issues in the U.S. mainstream news during the past two years (image 2).